Today I was Melbivated. It’s a peculiar feeling, similar to the sensation that engulfs you in a foreign city, enchanted by cobblestones and hypnotised by scents you recognise but can’t quite place. The difference is that Melbivation only materialises in Melbourne. Melbivate [mel-bi-veyt] verb (used with object), Melb·bi·vat·ed, Mel·bi·vat·ing. 1. to fascinate or hold the attention or interest of a native Melburnian, as by beauty or excellence: the flickering lights on the spire of the Arts Centre Melbivated him. 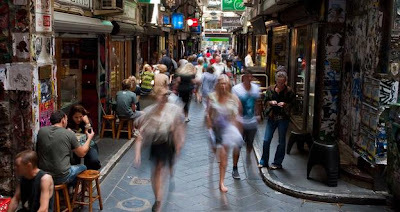 2. a physical reaction by which a typically Melbourne phenomenon or landmark causes one’s sympathetic nervous system to activate; resulting in increased heart rate, breathing, skin conductivity, etc. I was early for a meeting and had a bone to pick about my MYKI card. I made a beeline down Swanston Street towards Flinders Street Station, tracing the curb and daring oncoming traffic to see what would happen if they didn’t let me win the unspoken game of ‘chicken’. Past a man in metallic underwear, thrusting on a temporary stage set up for Melbourne International Comedy Festival. Past empty horses adorned with feathers, and carts topped with smoking tour operators. Past teenagers with moody fringes and absurd piercings, perched on Flinders Street Station steps. Up to the customer service window where a smiling Indian lady was unjustly copping the brunt of the government’s complicated new transport system. Sixteen dollars later, I had a new MYKI with $10 credit and an odd sense of guilt. I inhaled deeply. I felt myself being pulled along Collins Street, past a sea of suits with submarine sandwiches, to Block Arcade. The glass doors slid open in welcome. I stepped inside. Time slowed. My senses became acute. In a split second, my perception was dramatically altered in a Matrix-esque manner and my mood was left on the other side of the automatic doors. Over the next twelve minutes, I experienced intense Melbivation. Behind me, Melbourne CBD was fifty shades of grey, punctuated by a monotonous current of workers. But inside the bluestone façade of the old Briscoes Bulk Grain Store was a French Renaissance of mosaic cream and pale pink tiles and a collection of decorative plaster cornices. Grand arches and stained glass windows commanded a sharp intake of breath, accompanied by the faint perfume of sweet cinnamon from Gewürzhaus spice shop. A cold, calming echo reverberated off glittering diamonds in boutique jewellery stores. The tinkle of china from the Hopetoun Tea Rooms tickled my ears, interrupted by the chatter of tourist queuing outside for petites gâteaux and silver spoons. Little has changed since the Tea Rooms opened in 1892, all gaudy greens and royal gold interspersed with velvet. The pièce de résistance, an original etched mirror on the far wall, remains. A child erupted into tears, shattering any daydreams of 19th century Victorian elegance. The sound was so alien the frazzled mother turned and exited back through the sliding glass doors. My feet traced the mosaic floor of the Block Arcade. During the Second World War, it was blanketed in Feltex carpet to shield it from the harsh soles of military footwear. Made from tiles imported from Italy, the original cost of the floor is estimated to have been 600 pounds stirling, or $1,200 AUD. Although the carpet is long gone, the Victorian Heritage Register now protects the exquisite floor. I continued to the octagonal junction, flooded with natural light from the glass roof. A woman in an empty shoe store pulled a brogue to her face and inhaled blissfully, as if no one could see her through the expansive shopfront. 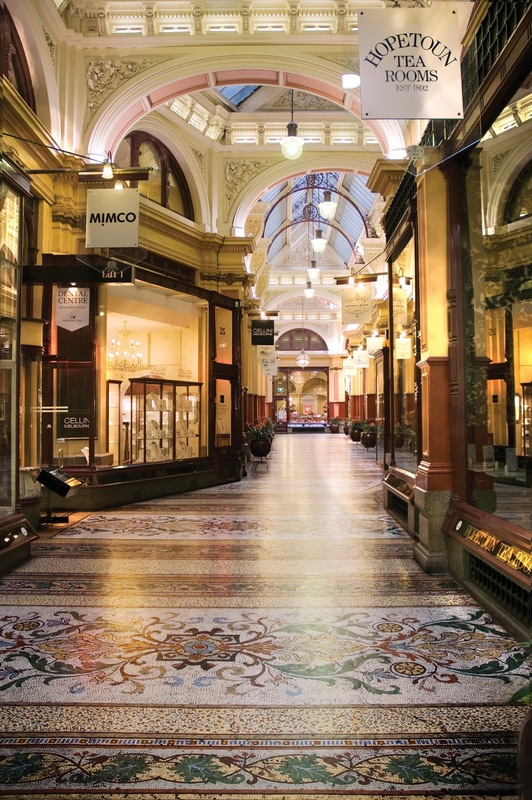 A menswear store advertised stiff shirts for $59 (or two for $100), almost twice the $36 that the Collins Street wing of The Block Arcade was auctioned for on June 1, 1837. I pressed my face up to the Haig’s window, inches away from an abundance of coconut roughs and an optimistic take on Melbourne’s fast approaching Winter (“It’s marshmallow season!”). A fleeting memory of charcoal-crusted campfire marshmallows filled my head. Before The Block Arcade was modelled on the Galleria Vittorio in Milan by then Melbourne Architects Twentyman & Askew, a magnificent fire swept the building. It was 1889; three years after the Collins Street building became the first Georges Store in Melbourne. The flames took flight at 6.15pm in September—on Friday the 13th, no less—and gutted The Block site. At the time, fire brigades were answerable to insurance companies. It was the greatest fire to break out in Melbourne and the catalyst for creating the Metropolitan Fire Brigade. My history lesson was interrupted by a Chinese woman who had stopped, dropped and rolled out her iPhone in the middle of The Block intersection. She reached her free hand in the air and lifted one finger, two fingers, three fingers to indicate to her mother when to smile. A few passers-by exchanged a look, including two men holding hands, one with a baby strapped to the front of his chest like a welcome growth. Around the corner is Block Place, a side street of cafés that congeal into one. There’s even a second Haig’s, just in case you don’t have enough self-control to resist twice. Red awnings close the lid on the laneway, enveloping the baritone hum of diners. Every now and then the higher pitch of a woman carries down the lane. “I know it’s meant to be,” one comforted. “He just doesn’t understand”, explained another. One restaurant boasts ‘Dinkum Pies’. Another café plays black and white movies projected onto a wall. It only took a minute to walk from one end of Block Place to the other, but it felt like ten. Graffiti tags and paste-ups add a dash of Melbourne Street culture, with quips such as “Jack and Jill went up the hill to fetch a pail of water, Jack fell down and broke his crown and Jill was acquitted on all charges”. People flew past me, a mix of self-important men grasping The Australian and gossiping teenagers in cropped jumpers. Italian men gathered at tables outside, talking with their hands and eyeing everyone who passed. They fitted the stereotypical appearance of mafia, but it’s most likely the arrogant way in which they carried themselves. There was the momentary warmth of a passing, portable heater. The prelude from Bach´s Cello Suite No. 1 wafted over the babble as I approached the corner of Block Place and Little Collins Street. A non descript man with grey hair in a striped jumper, ill-fitting jeans and sneakers had set himself up on a stool with a cello much too small for him. But none of it mattered; both his music and his smile were pure and beautiful. I turned right onto Little Collins and paused, breathing in his symphony. On my left I glimpsed the Dame Edna Place street sign set in fake gold and mock Hollywood light bulbs. It was impossible not to picture Barry Humphries’ purple locks and impossible diamante spectacles. I jaywalked to Causeway Lane, where the wicker chairs of Laurent Patisserie mimic those of Paris bistros, but then I was distracted by one of our city’s Big Issue workers in the compulsory red cap and commonplace wheelchair. I exchanged a pink note for a Big Issue magazine and chatted briefly to the man in the wheelchair. He nodded in constant agreement, his face oddly twisted, but not pained. Causeway Lane revealed more cafés. Opposite Laurent, sushi joints offered an alternative from the northern hemisphere. A young spruiker in a baggy t-shirt and leggings leaned outside a nameless restaurant. Her Converse shoes curled around each other. Her lopsided posture indicated indifference. Her feet hurt. There was the sudden aroma of fresh doughnuts and cigarette butts stamped into the asphalt. Sparrows narrowly avoided my face. One foot followed the other, towards the end. Pop music assaulted my ears from a glitzy fashion store at the end of the lane before I emerged into Bourke Street, met by applause. It was still overcast; a cool early autumn day that was yet to be tainted by the chill of winter. There was a crispness to the air, despite Melbourne’s cocooning CBD. Buildings from the late 1800s were juxtaposed against modern constructions with flashy Telstra signage. Trams emitted their infamous ‘ding’ as they warned people crossing the otherwise traffic-less road. 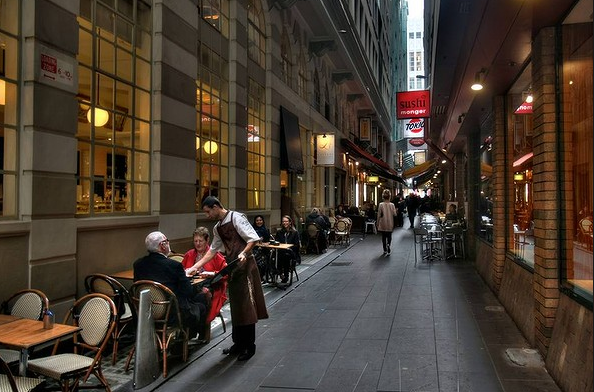 A wire grid above the tramlines impersonated the design of the city streets, Melbourne’s net. The applause subsided and a harmony of male voices filled the air, covering an uplifting Mumford and Sons tune. It rose to a climax, a celebration of maracas, tambourine, African djembe drums and acoustic guitar. The sweetness of the voices seemed at odds with the bare feet and dreadlocks behind them, just another of Melbourne’s idiosyncrasies. An audience had gathered: adolescents with moody fringes and absurd piercings, suits with submarine sandwiches, Asian tourists on iPhones, important men with The Australian tucked under their arm, girls post-gossip. Even other buskers had stopped to pay their respects. And in that perfect moment, I realised that they, too, were Melbivated.